One of the most interesting matches of the weekend will see Atletico Madrid play host to Sevilla as La Liga action resumes. UEFA recently announced that as of the 2018-19 season, the top four leagues in the world - La Liga, Bundesliga, Premier League and Serie A - will be guaranteed four Champions League spots every year. There is one more season, however, left to play before that new change goes into effect. This means that the top three teams in La Liga will automatically qualify for a Champions League spot, while the fourth place team will be left with a qualification round position. 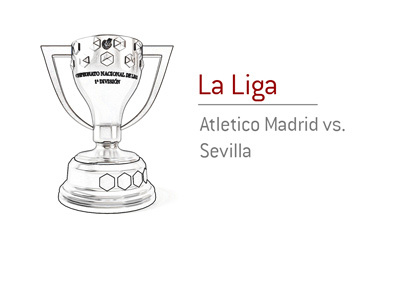 As a result, you can easily see why this weekend's game between Atletico Madrid and Sevilla is so important. If Atletico Madrid can win outright at home, they will move to within two points of Sevilla and the final guaranteed Champions League spot. Atletico Madrid is on the outside looking in when it comes to securing a guaranteed Champions League spot for next year, though they could move considerably closer to a spot with a big victory over Sevilla at home over the weekend.